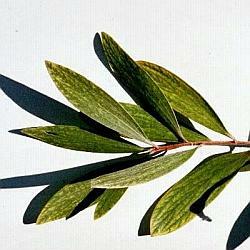 Comments: Evergreen broadleaf tree native to coastal New South Wales and Queensland, Australia. Dark green, 2" to 3" long leaves, white bottlebrush type flowers, and pea-shaped woody seed pods. 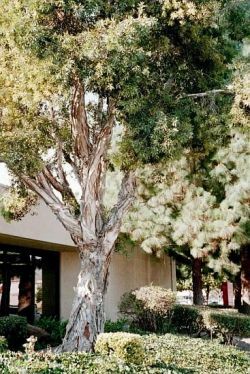 Persistant white Paper-like bark is a distinguishing feature of this tree species. Mature trees to 50' tall in native habitat, shorter locally. Trees do well in swampy soil, and have become a pest tree in Florida Everglades.